One mild form of punishment is to withdraw or remove something desirable, such as our hand or shoulder for perching. Many people have successfully reduced their birds' "beaky" behavior with this strategy, including watchband nibbling, earring snatching and shirt button cracking. Each and every time the bird engages in such behaviors, immediately but calmly and gently set him down for just a few seconds, then cheerfully offer him another opportunity to perch on your hand. With just a few repeated trials, most birds make the connection between the offensive behavior and being set down and they choose to stay put on your terms. No anger, frustration or rough handling is needed; only immediacy, removal, and a subsequent opportunity to do it right. Removing a bird from your hand for beaky behavior is also a good example of how the effectiveness of a particular strategy varies from individual to individual. Some birds do not want to be handled. For them, the consequence of being set down would be reinforcing as evidenced by their continued or increased beaky behaviors. Another example of mild punishment is to ignore a particular behavior, meaning to withhold attention for a behavior that has been previously given attention. Ignoring is not as easy as it sounds, but it is very effective when matched to the appropriate behavior and executed well. Here's the critical scientific fact about ignoring that you need to know: The first reaction most birds have to being ignored is to increase the frequency or intensity of the negative behavior. If your nerves wear thin and you stop ignoring during this predictable but temporary burst of behavior, you will reinforce it at this new higher frequency or intensity! Alternatively, if you maintain stalwart ignoring and do not waiver, the behavior will eventually decrease. Ignoring problem behavior is only effective for those behaviors that are being maintained because of our attention and for those behaviors that can be completely and totally ignored. Some behaviors cannot or should not be ignored. Biting is a case in point. Although it is often recommended that to reduce biting, one should simply buck up and ignore it, this is not a practical strategy. Minimizing one's reaction is certainly a good idea but it is darn near impossible to maintain the composure of a stone while being pinched with the vice-like beak of the average parrot. Also, it is likely that many birds find the tactile sensations associated with biting inherently reinforcing, quite aside from our reactions. Indeed the only reliable way to teach a parrot not to bite is to not give him the opportunity to do so in the first place. Of course, self-injurious or otherwise dangerous behaviors need to be dealt with using strategies other than ignoring, as well. When using mild punishment, ensure that the ratio of positive interactions to negative interaction is high. In an environment rich with praise and attention, mild methods to reduce behavior such as ignoring can be effective without apparent negative side effects. Nonetheless, not all of us are good ignorers or can ignore all types of behavior. And, some people find it too difficult to use the removal/withdrawal strategy with absolute consistency. Know your personal limitations and choose your teaching strategies to ensure success. At the other end of the punishment continuum is the presentation or delivery of aversive consequences. Unfortunately, the list of examples of this form of punishment is long and too familiar. Aversive punishment includes consequences such as shaking your hand to unseat a bird's balance, squirting water at a bird from a spray bottle, throwing things at a bird or his cage, dropping a bird on the floor, shutting a bird in a closet, covering a bird for extended periods during non-sleep time, knocking a bird off his perch, forcing a bird to rapidly and repeatedly step from one hand to another, blowing in a birds face, shouting, hitting, and plucking out feathers.Some people argue for the use of aversive punishment on the basis of its effectiveness; however, serious problems are likely to arise from the use of aversive strategies even in cases of short-term or narrowly defined success. For reasons explained below, no form of punishment that includes the presentation of aversive consequences should be used with companion parrots at anytime ... ever. It is not only unnecessary but also harmful. If you apply only one fact about punishment to teaching your parrot, let this be the one. The use of even mild forms of punishment warrants careful deliberation and thoughtful planning. First, you should consider the nature of the behavior you hope to teach your bird to exhibit less often. It is not reasonable to try to eliminate natural behaviors such as the infamous cockatoo dawn greeting ceremony, those frustrating food-tossing marathon events or the hungry shark transformation that otherwise sweet birds exhibit when you dare to put your hand in their cages. With a little creativity, the responsibility for accommodating frustrating or annoying natural behaviors rests quite comfortably on human shoulders. Perhaps you can take your shower while your bird welcomes the day; special cups and cage aprons go a long way to reduce the mess caused by natural food- tossing behavior; and feathered sharks can be peaceably removed from their cages on perching sticks and returned to their feathered angel states once they are outside of their cages. Very often, the behavior driving you crazy is a legitimate expression of unmet needs. When this happens, the appropriate strategy is to meet the bird's needs rather than treating the communication as a problem behavior. For example, birds do not typically scream incessantly when they are well nourished, appropriately housed, provided ample time out of their cages, engaged in independent play, and offered daily, focused time with family members. Finally, consider how to change the behavior. If there is a positive alternative strategy to even mild punishment (and in our experience there most often is), use it. Positive teaching strategies have all sorts of positive spin-offs and none of the detriments of punishment. Positives spin-offs for your bird include the opportunity to learn to do something more not less, to learn new behaviors rather than unlearn old ones, to live in an environment saturated with praise, and to increase confidence that only good things happen in the presence of humans – a requisite for trust. There are many highly effective alternatives to punishment. Teaching acceptable replacement behaviors or teaching behaviors that are incompatible with the negative behavior are two examples well worth learning about. 1. Is it unreasonable or inappropriate to expect a bird to stop behaving in this way? 2. Is the negative behavior a result of an unmet need? 3. Is there a positive teaching strategy that can be used instead of punishment? If the answer to any of these questions is yes, look for ways to change your expectations, meet your bird's needs, and/or use a positive teaching strategy to help you and your bird become the best possible companions for the long-run. Research on the effects of aversive punishment is not new nor has it been narrowly investigated. On the contrary, this research spans many decades and has been replicated with many different species of animals, including humans. Although there is some variability in the way researchers describe their results, the fact is there is a pattern of negative reactions or "side effects" that are consistently observed in many subjects who have been punished with aversive consequences. The first predictable side effect is a sustained effort to escape the punishing situation. 4. Over-generalize fear, often to the point of phobia. For most of us, these side effects are painful to read about no less observe, in our beloved parrots. Sadly, many of us have known or heard about birds that have withdrawn by refusing opportunities to come out of their cages. These poor souls cower dismally in the corners of their cages for hours on end. Other birds may suppress responding to the most basic activities. They can refuse to step up or even stop eating. It is not unheard of for birds to attack their owners or become fearful of people and things that never caused them any direct harm. Based on these scientific facts, there is no justification for using aversive punishment with our birds. There are no long-term benefits, and the costs are grave. Ironically, it is the short-term effect of punishment that keeps so many of us using it. Every time an animal responds to punishment by doing something less often, the person who delivered the punishment is rewarded. For example, if your parrot stops chewing the windowsill when you throw a shoe at him, chances are you will throw shoes more often. This presents a significant obstacle to reducing our use of punishment to influence behavior and is worthy of introspection. Whatever we call ourselves in reference to our parrots, be it pet owner, caretaker, parent or guardian, we are all teachers in the most fundamental sense. Each and every moment spent with our birds is a moment that teaches them something about living with humans. In the perpetual role of teacher, we should borrow the physicians' guiding principle: First do no harm. We have learned from years of empirical study over hundreds of scientific experiments that in fact aversive punishment does do harm. We have also learned that even mild forms of punishment should be used cautiously and knowledgeably. The individual nature, age, species and history of any particular bird add another level of complexity to choosing the best practices for our parrots. Some birds, those that are confident, bold and trusting, can be resilient to some punishment techniques. In other words, we may well get away with lesser teaching strategies with some birds under some conditions that would be detrimental to others. However, experience has shown that very young birds, re-homed birds, and birds with existing medical and/or behavioral problems are especially vulnerable to the adverse responses associated with punishment. There will always be many unknowns about behavior; there will always be important variables that are out of our control. Behavior is just too complex for simplistic cookbook approaches to mentoring our birds where we look up problem behaviors in a table of contents and follow behavioral recipes. Each situation is unique and requires careful analysis and informed consideration. 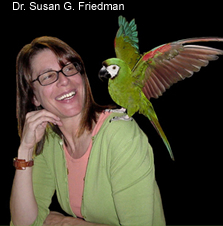 Facilitating well-adjusted, independent, confident companion parrots through the use of positive teaching techniques is more than just a commitment to learning new strategies; it is also a commitment to changing our legacy. The time for such change is now.